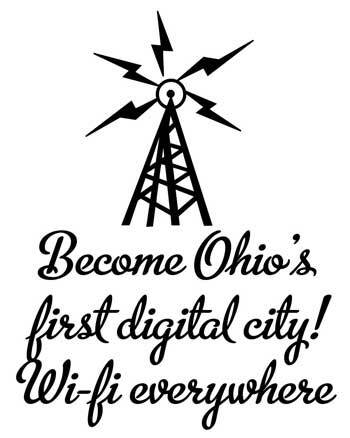 Become Ohio’s first Digital city. I believe that it’s time to make Dayton remarkable for doing things that other cities can’t pull off. The spirit of the Wright Brothers, Kettering, Deeds etc. It’s time to innovate our way to prosperity. To make Dayton the place people want to move to- instead of move away from. I see Dayton as a land of opportunity- where it’s easy for everyone to prosper, with our low cost of living, great water, and by turning every neighborhood into a vibrant community where people like their neighbors (it’s happened in South Park- my neighborhood where “neighbors become friends”). There are two stories that I bring to this narrative- stories of kids triumphing over obstacles, of taking charge of their futures and creating value. via Given Tablets but No Teachers, Ethiopian Children Teach Themselves | MIT Technology Review. Considering I’ve been in parts of West Dayton where my cell phone couldn’t connect with the Internet- I believe that our children and our community are being isolated from the greatest learning tool and equalizing technology on the planet. We have to not only be able to get our kids online- but, give them the opportunity to teach themselves, if our parents and schools can’t. Like this kid in Mongolia- who got accepted to MIT. It’s sad when a kid in Mongolia has better access to the Internet than American citizens. When he was 15 years old, Battushig Myanganbayar of Ulan Bator, Mongolia got a perfect score in the MIT Circuits and Electronics course he took through edX, the online education platform MIT co-founded with Harvard. via Mongolian Teen Aces an MIT Online Course, Then Gets Into MIT. iPads cost less than library books. If we want a community of readers- access to Project Gutenberg is a great start. 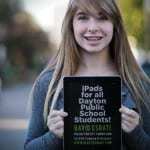 Every Dayton public school student gets an iPad. From Kindergarten to 12th grade. Why an iPad? For one, Apple is the number one premium brand and invented the tablet as we know it. We need to polish our communities cache. Second, the iPads have tracking software and virtually bullet proof ID- there is little incentive to steal them. Third- Apple has more apps- and experience in delivering computers in schools than anyone else. Also- all the new testing requires computers- and right now DPS has 1 computer for every 4 students- hardly enough to handle the upcoming requirements. Also- consider this fact alone- books are the second biggest expenditure after salaries- and with iPads- there is an entire library of classic books available to every student without any additional cost. The entire state of New Hampshire gave their students Mac Books years ago, LA has just spent a billion dollars equipping their kids with iPads (with some stupid controversy). Wi-fi everywhere. For the kids to be able to maximize the use of their tablets- they need to be able to get online. Also- every citizen who has a smart phone, will no longer be up against expensive data caps from cell phone companies. Getting online in Dayton should be as easy as breathing. We need to get our community engaged and connected- to jobs, to each other, to build our neighborhoods- using sites like www.nextdoor.com as community hubs. This isn’t new- the entire country of Estonia- now referred to as e-Stonia, was covered in WiFi a decade ago. Fiber with gigabit speed- it’s in the ‘burbs, but it’s not coming to Dayton fast. Because of our rate of poverty in the region, telcos aren’t making a push to extend the fastest or best service. When Google Fiber was up for grabs via a competition- our city leaders were all for it- once Google picked Kansas City- then Provo UT and Austin TX, they forgot about it. We have a fiber backbone in place already running our traffic lights- it’s time to expand it. Social mobility- the ability to move from poverty to wealth, is a key measure of a communities health. Dayton ranks very low on this scale- it’s a primary goal of mine to change that statistic. While Nan Whaley and Joey Williams- the “Endorsed Democrats” and big money campaign- has had 8 years of control of the commission- they’ve chosen to invest our money in either building bricks and mortar- or tearing down bricks and mortar and filling landfills. From Tech Town to the failed Kroger at Wayne and Wyoming- they think differently than I do in terms of how to raise the standards of living in Dayton. It’s my belief that the number one factor in measuring the success of our policy isn’t the number of houses- but the number of people who choose to live in Dayton- and their average income. I believe by making investments in the technology to engage and enrich our communities minds is much more important than what we do with vacant houses. In fact, I think less of them will be vacant if we implement these kinds of investments. One of the mistakes I made in my past campaigns was assuming that most voters were online and depending on my digital literacy to pay off. Sadly, many voters don’t even have email addresses- or access. This may sound astounding to you- but it’s a fact in Dayton. That’s why I need you- especially if you are a Dayton Public School student, to spread the word about my campaign. Either Dayton is going to move forward with my election to the Dayton City Commission, or we’re going to stagnate, spending our money making empty lots and a taller landfill. Patrick- oh, how I need to learn Ruby. But, that’s beside the point. Kansas City has seen a bump in tech startups thanks to Fiber. I don’t expect bandwidth to cure everything- but, I do believe if we start working for the citizens en masse instead of just a developer here- a neighborhood there- we may start to pick up momentum like we’ve never seen. I wish you the best on your project. @Brianne Fowler- it depends on where the funding comes from. However, more than likely, we will only be supplying public schools- and Dayton residents. However, you will still have access to the wifi system- and each neighborhood will have a place for gigabit Internet access for students. We will also try to make available devices at a lower cost for Charters via the buying power.